Since I don’t want to manually note down the schedules for my maintenance tasks, I wrote a couple of PowerShell scripts to backup and restore the site maintenance task settings for me. The backup script will export the settings for each site maintenance task and save them to file in json format. 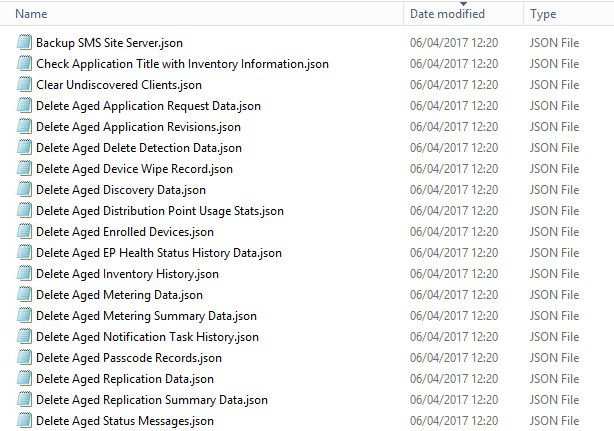 The restore script will then read each backup file, compare the current settings in WMI with the backed-up settings for each maintenance task, and update anything that doesn’t match. The script will tell you if anything has changed and what the old and new values are. If you run the backup before you disable the tasks, the restore script will re-enable them again. Both scripts should be run elevated on your primary site server.